Get All Three Books by Dan Montez NOW! 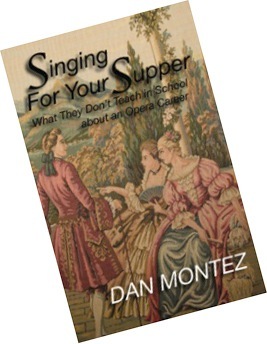 In his third and latest book, Dan Montez has laid out the psychological path to becoming a true artist, and in particular and opera singer. His first book, Don’t Believe it, was motivational. His second, Singing for Your Supper, filled in the gaps left by educational institutions that opera singers need to build and maintain a successful career. Now, finally, Singing in Your Sleep explains clearly why so many people that want careers in the arts cannot make it. It discusses the intense and powerful psychology of opera singers and the specific changes you will need to make to your personality to become a great artist. 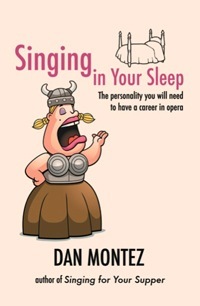 Singing in Your Sleep ultimately gives you the necessary tools you will need if you deeply desire to become an opera singer or any other kind of artist. It will teach you the how to develop the habits and lifestyle of the artist and keep you from sabotaging your career. You can be an artist and you can make money. Don’t let anyone tell you anything different. Finally, a book has been written for those who want to become professional singers and who understand that educational institutions won't teach them everything they need to know. Singing for Your Supper: What they Don't Teach in School about an Opera Career will guide you through both the singing and business skills you will need to have a career in opera. *How to stay in business as a performer and MAKE MONEY! 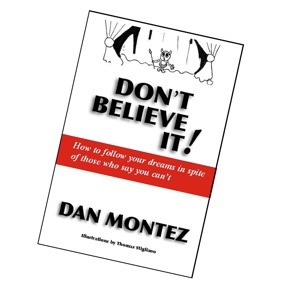 In this best seller, Dan Montez gives us a survival manual that will help you navigate through a world of negativity and introduce you to the kind of person you will have to become to achieve your dreams. he shares some of his own successes and failures along the road to achieving his own dreams and unique lifestyle. In spite of everyone who told him he couldn’t sing, Dan Montez became a world class opera singer, a linguist, a concert pianist, a conductor, a composer, a pedagogue and the manager of his own opera company. Are you doing what you want with your life? Are you working for your dreams or for other people's dreams? Does everyone tell you that you can’t make money doing exactly what you want to do?